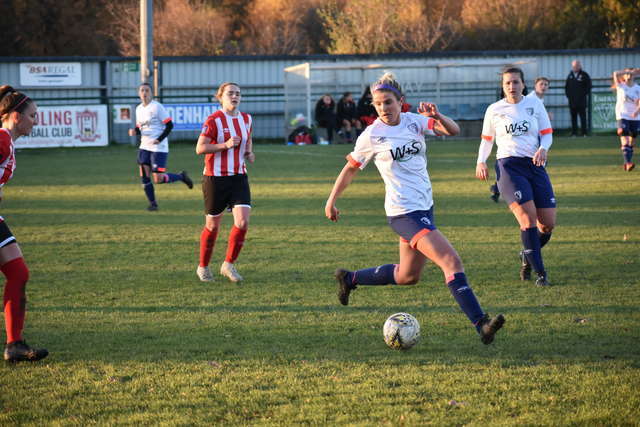 AFC Bournemouth Women were defeated 3-0 by Southampton Saints Ladies FC on Sunday afternoon to exit the Hampshire FA Cup. AFC Bournemouth Women were defeated 3-0 by Southampton Saints Ladies FC on Sunday afternoon. Taking place at the BTC Sports Ground, a brace from Alisha Buckingham coupled with a goal from Krystal Whyte sealed the win and a place in the second round for the hosts. Saints led by a goal at the break despite a couple of chances for the visiting Cherries, with the away side charged with keeping things tight in the second period. However, moments after the restart Saints had a second goal, making the task facing Bournemouth all the greater. The Cherries fought for a way back into the game and Jade Hockey saw a close-range shot brilliantly saved by the 'keeper. Next, Rebecca Davis was sent through on-on-one with the 'keeper but struck her effort off target, with Southampton going on to score a third to secure the cup win.